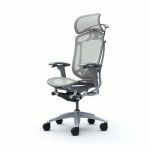 OKAMURA Ergonomic Office Chairs combines excellent conformity and smart operating functions for a variety of work scenarios and postures. Workers worldwide appreciate the distinctive designs and superb functionality of these chairs. OKAMURA Corporation founded in 1945 in Yokohama City, taking the name of its location in Okamura Town. This motto defines the Okamura approach to the creation of quality products that can be used and enjoyed for many years. Okamura has built a reputation for quality by continually improving the technology used in product development, manufacturing and quality assurance processes. The Okamura Production System (OPS) is based on the Toyota Production System (TPS) and is Okamura's own developed production method. Okamura Ergonomic Office Chairs were certified by the Ergonomics Excellence Awards Board. 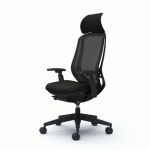 This is the most prestigious ergonomics certification in Europe and is granted by the U.K. Furniture Industry Research Association (FIRA). 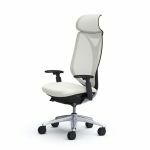 Awarded based on examinations undertaken by FIRA to assess their true ergonomic properties, only products that meet strict requirements receive this certification. OKAMURA SYLPHY Chair with Polished Frame. OKAMURA SYLPHY Chair with Black Frame. 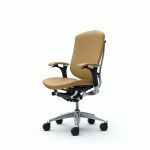 With the goal of creating a better chair, Okamura incorporated scientific knowledge into its development in 1961. 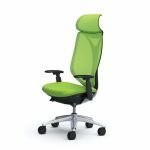 Continuing research into the relationship between people and chairs, Okamura developed the ankle tilt reclining mechanism. A chair incorporating that mechanism, the FC-9 chair, was then produced in 1992. As a mechanism enabling optimum sitting comfort while reclining, ankle tilt reclining was also adopted on subsequent chairs. 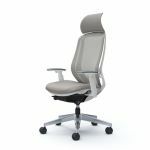 Okamura is taking a variety of initiatives in order to deliver even better chairs to people everywhere. For example, to achieve more refined styling, Okamura has produced a number of chairs in a collaboration with the world-renowned Italian product design firm Giugiaro Design. Starting in 1961 Okamura began research into muscle-fatigue measurement and body-pressure analysis by providing various types of experimental chairs and by sponsoring research. At that time, we succeeded in obtaining body-pressure distribution charts, muscle activity graphs and other data by taking a scientific approach to sitting comfort. 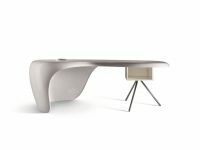 Okamura carries out scientific measurements of conditions when a person sits in a chair, and using computer analysis, Okamura applies the data to chair design. Okamura confirms the quality and safety of products by conducting repeated durability and performance tests under in-house standards stricter than JIS or other industry standards. That way, customers can use our products for a long time with peace of mind. Okamura thoroughly eliminates waste that does not lead to added value through the Okamura Production System(OPS), its own system for managing production. 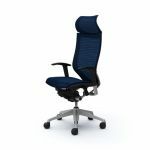 With that, Okamura improves productivity and stabilize quality in an aim to achieve a business structure right for manufacturing craftsmanship.